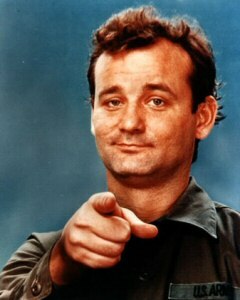 I was a Bill Murray fan before I was old enough to be a Bill Murray fan. I thought he was funny. He was always the irreverent clown of the group. But being the play-by-the-rules type I could never try the stuff he did. So I just opted to try to be funny. (I’m still trying.) In a scene in the movie Meatballs (no, this isn’t an endorsement of the movie) Bill tried to give a pep talk to a depressed summer camp kid. At the climax of his pep talk he lead the room in repeating/chanting/yelling, “It just doesn’t matter!” Ever felt like that? David (as in King David) did. Solomon did. Job did. Moses did. If you have ever felt that way, if you feel that way right now, it’s OK. You’re in good company. There are lots of reasons to say that, and there are lots of reasons to mean it. This is never going to work or be successful, it just doesn’t matter, so I quit. No one is going to find a solution for this problem, it just doesn’t matter, I give up. I’m going to do what I need to do regardless of what people think, it just doesn’t matter what anyone else says. So what if a shark bit my arm off and I love to surf, it just doesn’t matter because I’m surfing. The phrase can swing both ways. It applies when you feel hopeless, and it applies to overcoming obstacles that are in your path. Have you ever met someone and you really like what you see in them, then learn later, perhaps much later, that they have some aspects to their personality that aren’t really faults, they just make you uncomfy? The same can apply to a group of people, a team, a club, or a job. You really like the company, what they stand for, what their goals are, and they way they get things done, so you take the job. You get to know the inner workings of the company and after a few years you see some things you don’t like. Do those things negate the things you liked originally? Not at all. They are still real and in operation. And you haven’t been ignorant about those things you don’t like, you’ve just never known them or noticed them before. Now it seems like it’s all you can see. They too are real and you have to deal with them. In the end though, it just doesn’t matter. Those things were there the whole time you didn’t notice them. They will always be there. Maybe not in the same form, but they will be there. You could get a new job at a new company, but you are still going to find them. So instead of hopping around, dig into the good and do it. Do what you like about it and do what you have to do to deal with what you don’t like. Change what you can, and that always begins with you. Christians are like this. Churches are like this. Movements are like this. Do what you are called and gifted to do because the rest of it just doesn’t matter. I made the mistake of cruising around the blogosphere before going to bed. I don’t know why I torture myself like this and then share it with you. What are you doing reading this anyway? Don’t you have anything better to be doing? There is so much going on out there it’s ridiculous. The editorials. The comments. There is so much that is broken in churches and in people. It makes you want to do something about, but you can’t. It just doesn’t matter because you can never fix all of it. What can we do? We can start by not getting hung up on what we have no influence over, and instead draw near to God and He will draw near to us. We can pour what we have of Jesus in us into the lives of others and continually seek the Holy Spirit to pour Himself into us. Be a funnel. Don’t get all clogged up with a bunch of other stuff because then you have to call Roto-Rooter, it’s a messy job, and you just waste time an energy. Deal with what you can, what you are called to deal with, do so in the power of the Spirit. Whatever may try to stop you or stand in your way just doesn’t matter. Focus on what does matter and deal with that. By doing so, what just doesn’t matter will be dealt with or will take care of itself. Thanks for the advice, Bill. One of my friends from Charleston SC called today. She and her daughter were in Whole Foods, and she ran into Bill Murray (literally). She stuttered and stumbled, saying that she knew who he was. He said, “I’ll bet you’re wrong.” and walked a way. After she checked out, Bill M. was waiting for her at the front of the store and pushed her cart and daughter out for her. Great story! I drove by the golf course he and his brothers own. Wouldn’t it be great if Bill got saved? he would be a great voice for the Lord. And thanks for not referring to him as BM.